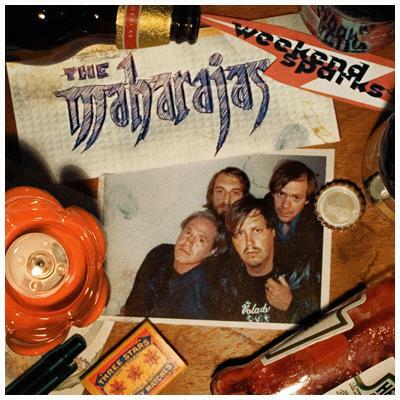 The Maharajas - "Weekend Sparks" 7"
The Maharajas - "Weekend Sparks"
This is a really great 7" 60's garage rock record. The band has been around for quite awhile, being formed in the mid 90's in Stockholm. The band is lead by Jens Lindberg (Crimson Shadows, Stomachmouths, The Maggots). While I have not heard the bands other material, this is great. Really cool catchy tracks with a lot of personality. Sometimes I Miss Me really reminds me of some of the tracks from the latest Liquid Visions record (one of my faves of 2006!). Pinned Down is another great number and features some pretty psyched out guitar! Flip the record over and you get the title track, which is the catchiest track and has a great groove. (Take A) Look at Yourself ends the 7" record and brings things down a bit and also changes the singer (to Jens). This song is a real 60's throwback as well. I can't wait to hear the full length record next year, due out on the great Crusher Records from Göteborg. For more information you can visit The Maharajas web site at: http://www.myspace.com/themaharajas. Visit the Crusher Records web site at: http://www.crusherrecords.com.